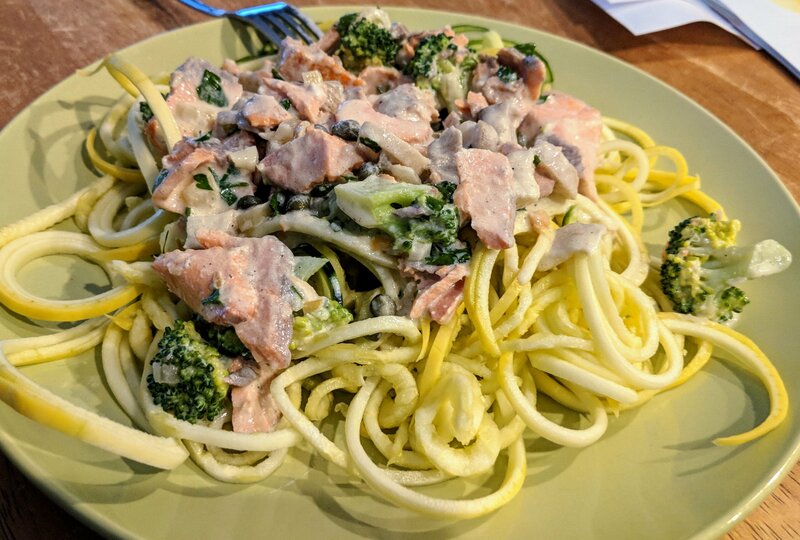 Creamy wild Alaskan salmon with veggies. Perfect for any low carb diet. 1. Descale and wash the fish. Fry the salmon with the avocado oil for a few minutes, turning once (do not overcook). Remove its skin and eat it (if applicable). Add lemon juice on the fish, and set aside. 2. In a small pan heat water and add the mushrooms to boil for a few minutes. Add the broccoli florets for another 1-2 minutes (must remain a little bit crunchy). Strain, set aside. 3. In a large pot heat the butter with the black pepper, garlic and shallot. When browned, add the sour cream and parmesan. Stir to combine, but don’t let it get too cooked (no more than 30 seconds on fire, just enough for the parmesan to melt). 4. Cut the salmon in small pieces, add it to the cream. Add the mushrooms, broccoli, and capers, and carefully combine. Sprinkle with chives or parsley, serve with spiralized “zoodles”.